Roselle (Hibiscus sabdariffa) is a species of Hibiscus probably native to West Africa, used for the production of bast fibre and as an infusion, in which it may be known as carcade. It is an annual or perennial herb or woody-based subshrub, growing to 2–2.5 m (7–8 ft) tall. The leaves are deeply three- to five-lobed, 8–15 cm (3–6 in) long, arranged alternately on the stems. The flowers are 8–10 cm (3–4 in) in diameter, white to pale yellow with a dark red spot at the base of each petal, and have a stout fleshy calyx at the base, 1–2 cm (0.39–0.79 in) wide, enlarging to 3–3.5 cm (1.2–1.4 in), fleshy and bright red as the fruit matures. They take about six months to mature. The roselle is known as the rosella or rosella fruit in Australia. It is known as Belchanda among Nepalese, Tengamora among Assamese, Gal•da among Garos, Amile among Chakmas, Hanserong among Karbi, Sillo Sougri among Meitei and mwita among the Bodos. The Atongs call it "dachang" or "datchang". It is called as "gongura" by Telugu-speaking people from India. It is known as Saril or flor de Jamaica in Central America and "Sorrel" in many parts of the Caribbean. Among the Yoruba in South West Nigeria, it's known as "Isapa". In Chinese, roselle is known as luo shen hua (洛神花). In Burmese, roselle is known as chin baung (ချဉ်ပေါင်). The plant is primarily cultivated for the production of bast fibre from the stem. The fibre may be used as a substitute for jute in making burlap. Hibiscus, specifically roselle, has been used in folk medicine as a diuretic and mild laxative. The red calyces of the plant are increasingly exported to the United States and Europe, particularly Germany, where they are used as food colourings. It can be found in markets (as flowers or syrup) in places, such as France, where there are Senegalese immigrant communities. The green leaves are used like a spicy version of spinach. They give flavour to the Senegalese fish and rice dish thieboudienne. Proper records are not kept, but the Senegalese government estimates national production and consumption at 700 t (770 short tons) per year. In Burma their green leaves are the main ingredient in chin baung kyaw curry. Brazilians attribute stomachic, emollient, and resolutive properties to the bitter roots. In Andhra cuisine, roselle is called gongura and is extensively used. The leaves are steamed with lentils and cooked with dal. Another unique dish is prepared by mixing fried leaves with spices and made into a gongura pacchadi, the most famous dish of Andhra cuisine, often described as king of all Andhra foods. In Burmese cuisine, called chin baung ywet (lit. sour leaf), the roselle is widely used and considered affordable. It is perhaps the most widely eaten and popular vegetable in Burma. The leaves are fried with garlic, dried or fresh prawns and green chili or cooked with fish. A light soup made from roselle leaves and dried prawn stock is also a popular dish. Among the Paites tribe of the Manipur Hibiscus sabdariffa and Hibiscus cannabinus locally known as anthuk are cooked along with chicken, fish, crab or pork or any meat, and cooked as a soup as one of their traditional cuisines. In the Khasi Hills of Meghalaya, the plant is locally known as jajew, and the leaves are used in local cuisine, cooked with both dried and fresh fish. The Bodos of north east India cook its leaves with fish, shrimp or pork which is much relished. Sometimes they add native lye called karwi to bring down its tartness and add flavour. In the Philippines, the leaves and flowers are used to add sourness to the chicken dish tinola (chicken stew). In Vietnam, the young leaves, stems and fruits are used for cooking soups with fish or eel. In Mali, the dried and ground leaves, also called djissima, are commonly used in Songhaï cuisine, in the regions of Timbuktu, Gao and their surroundings. It is the main ingredient in at least two dishes, one called djissima-gounday, where rice is slowly cooked in a broth containing the leaves and lamb, and the other dish is called djissima-mafé, where the leaves are cooked in a tomato sauce, also including lamb. Note that djissima-gounday is also considered an affordable dish. In the Caribbean, a drink is made from sepals of the roselle fruit. It is prepared by boiling fresh, frozen or dried sepals; and sometimes the calyces and seeds, of the fruit of the sorrel plant in water for 8 to 10 minutes (or until the water turns red), then adding sugar. It is often served chilled. This is done in St. Vincent and the Grenadines, Trinidad and Tobago, Guyana, Antigua, Barbados, Belize, St. Lucia, Dominica, Grenada, Jamaica and St. Kitts and Nevis where the plant or fruit is called sorrel. The drink is one of several inexpensive beverages (aguas frescas) commonly consumed in Mexico and Central America; they are typically made from fresh fruits, juices or extracts. In Mexican restaurants in the US, the beverage is sometimes known simply as Jamaica (Spanish pronunciation: [xaˈmai.ka] HAH-MY-CAH). It is very popular in Trinidad and Tobago especially as a seasonal drink at Christmas where cinnamon, cloves and bay leaves are preferred to ginger. It is also popular in Jamaica, usually flavored with rum. In Mali, Senegal, The Gambia, Burkina Faso, Ivory Coast and Benin calyces are used to prepare cold, sweet drinks popular in social events, often mixed with mint leaves, dissolved menthol candy, and/or fruit flavors. The Middle Eastern and Sudanese "Karkade" (كركديه) is a cold drink made by soaking the dried Karkade calyces in cold water overnight in a refrigerator with sugar and some lemon or lime juice added. It is then consumed with or without ice cubes after the flowers have been strained. In Lebanon, toasted pine nuts are sometimes added. 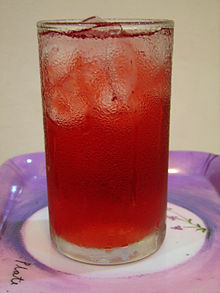 Roselle is used in Nigeria to make a refreshing drink known as Zobo and natural fruit juices of pineapple and watermelon are added. Ginger is also sometimes added to the refreshing drink. With the advent in the U.S. of interest in south-of-the-border cuisine, the calyces are sold in bags usually labeled "flor de Jamaica" and have long been available in health food stores in the U.S. for making tea. In addition to being a popular homemade drink, Jarritos, a popular brand of Mexican soft drinks, makes a flor de Jamaica flavored carbonated beverage. Imported Jarritos can be readily found in the U.S. In the US, a beverage known as hibiscus cooler is made from the tea, a sweetener, and sometimes juice of apple, grape or lemon. The beverage is sold by some juice companies. In the UK, the dried calyces and ready-made sorrel syrup are widely and cheaply available in Caribbean and Asian grocers. The fresh calyces are imported mainly during December and January to make Christmas and New Year infusions, which are often made into cocktails with rum. They are very perishable, rapidly developing fungal rot, and need to be used soon after purchase — unlike the dried product, which has a long shelf-life. In Africa, especially the Sahel, roselle is commonly used to make a sugary herbal tea that is sold on the street. The dried flowers can be found in every market. Roselle tea is quite common in Italy where it spread during the first decades of the 20th century as a typical product of the Italian colonies. The Carib Brewery Trinidad Limited, a Trinidad and Tobago brewery, produces a 'Shandy Sorrel' in which the tea is combined with beer. In Thailand, roselle is generally drunk as a cool drink, and it can be made into a wine. Rosella flowers are sold as wild hibiscus flowers in syrup in Australia as a gourmet product. Recipes include filling them with goats cheese; serving them on baguette slices baked with brie; and placing one plus a little syrup in a champagne flute before adding the champagne — the bubbles cause the flower to open. In Nigeria, rosella jam has been made since colonial times and is still sold regularly at community fetes and charity stalls. It is similar in flavour to plum jam, although more acidic. It differs from other jams in that the pectin is obtained from boiling the interior buds of the rosella flowers. It is thus possible to make rosella jam with nothing but rosella buds and sugar. In Burma, the buds of the roselle are made into 'preserved fruits' or jams. Depending on the method and the preference, the seeds are removed or included. The jams, made from roselle buds and sugar, are red and tangy. In India, Roselle is commonly made into a type of pickle. Rosella jam is made in Queensland, Australia as a home-made or speciality product sold at fetes and other community events. Although a 2010 meta-analysis using 14 databases and hand searching journals conducted by the Cochrane hypertension group concluded "No studies were identified that met the inclusion criteria" a more recent meta-survey (2015) in the Journal of Hypertension suggests a typical reduction in blood pressure of around 7.5/3.5 units (systolic/diastolic). China and Thailand are the largest producers and control much of the world supply. Thailand invested heavily in roselle production, and their product is of superior quality. China's product, with less stringent quality control practices, is less reliable and reputable. The world's best roselle comes from Sudan and Nigeria, but the quantity is low. Mexico, Egypt, Senegal, Tanzania, Mali and Jamaica are also important suppliers but production is mostly used domestically. In the Indian subcontinent (especially in the Ganges Delta region), roselle is cultivated for vegetable fibres. Roselle is called meśta (or meshta, the ś indicating an sh sound) in the region. Most of its fibres are locally consumed. However, the fibre (as well as cuttings or butts) from the roselle plant has great demand in natural fibre using industries. 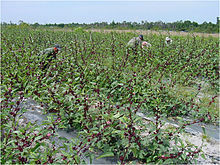 Roselle is a relatively new crop to create an industry in Malaysia. It was introduced in the early 1990s and its commercial planting was first promoted in 1993 by the Department of Agriculture in Terengganu. The planted acreage was 12.8 ha (30 acres) in 1993 and steadily increased to peak at 506 ha (1,000 acres) by 2000. The planted area is now less than 150 ha (400 acres) annually, planted with two main varieties. Terengganu state used to be the first and the largest producer, but now the production has spread more to other states. Despite the dwindling hectarage over the past decade or so, roselle is becoming increasingly known to the general population as an important pro-health drink. To a small extent, the calyces are also processed into sweet pickle, jelly and jam. In the initial years, limited research work was conducted by University Malaya and Malaysian Agricultural Research and Development Institute (MARDI). Research work at Universiti Kebangsaan Malaysia (UKM) was initiated in 1999. In many respects, the amount of research work is considered[by whom?] meagre in supporting a growing roselle industry in Malaysia. Hibiscus Acid has been isolated from its calyx which is done by the Institute for Integrated Programmes and Research In Basic Sciences, Mahatma Gandhi University Kerala. Genetic variation is important for plant breeders to increase crop productivity. Being an introduced species in Malaysia, there is a very limited number of germplasm accessions available for breeding. UKM maintains a working germplasm collection and conducts agronomic research and crop improvement. Conventional hybridization is difficult to carry out in roselle due to its cleistogamous nature of reproduction. Because of this, a mutation breeding programme was initiated to generate new genetic variability. The use of induced mutations for its improvement was initiated in 1999 in cooperation with MINT (now called Malaysian Nuclear Agency) and has produced some promising breeding lines. Roselle is a tetraploid species; thus, segregating populations require longer time to achieve fixation as compared to diploid species. In April 2009, UKM launched three new varieties named UKMR-1, UKMR-2 and UKMR-3. These new varieties were developed using Arab as the parent variety in a mutation breeding programme which started in 2006. The Hibiscus leaves are a good source of polyphenolic compounds. The major identified compounds include neochlorogenic acid, chlorogenic acid, cryptochlorogenic acid, caffeoylshikimic acid and flavonoid compounds such as quercetin, kaempferol and their derivatives. The flowers are rich in anthocyanins, as well as protocatechuic acid. The dried calyces contain the flavonoids gossypetin, hibiscetine and sabdaretine. The major pigment, formerly reported as hibiscin, has been identified as daphniphylline. Small amounts of myrtillin (delphinidin 3-monoglucoside), chrysanthenin (cyanidin 3-monoglucoside), and delphinidin are present. Roselle seeds are a good source of lipid-soluble antioxidants, particularly gamma-tocopherol. A popular roselle variety planted in Malaysia: Terengganu. Roselle fruits are harvested fresh, and their calyces are made into a drink rich in vitamin C and anthocyanins. Two varieties are planted in Malaysia — left Terengganu or UMKL-1, right Arab. The varieties produce about 8 t/ha (3.6 short tons/acre) of fresh fruits or 4 t/ha (1.8 short tons/acre) of fresh calyces. On the average, variety Arab yields more and has a higher calyx to capsule ratio. Roselle calyces can be processed into sweet pickle. This is usually produced as a by-product of juice production. However, quality sweet pickle may require a special production process. Calyx (a collective term for sepals of a flower); Epicalyx (a collective term for structures found on, below, or close to the true calyx, also called false calyx). Some varieties show pronounced epicalyx structures, such as found in variety Arab (plural calyces). Some breeding lines developed from the mutation breeding programme at UKM. ^ Peter, K.V (2007). Underutilized and Underexploited Horticultural Crops, Volume 2. Kerala, India: New India Publishing Agency. p. 204. ISBN 8189422693. ^ Peter, K.V (2007). Underutilized and Underexploited Horticultural Crops, Volume 2. Kerala, India: New India Publishing Agency. p. 205. ISBN 8189422693. ^ Hansen, Barbara (1993-10-07). "Uncommon Herbs : In a Burmese Garden". Los Angeles Times. ^ Tanaka, Yoshitaka; Van Ke, Nguyen (2007). Edible Wild Plants of Vietnam: The Bountiful Garden. Thailand: Orchid Press. p. 91. ISBN 9745240893. ^ "Hibiscus Cooler". R.W. Knudsen Family. Retrieved 2018-06-04. ^ ezimerchant Professional. "Rosella Jam 120g". Bushtuckershop.com. Retrieved 2014-03-29. ^ Ngamjarus C, Pattanittum P, Somboonporn C (2010). "Roselle for hypertension in adults". Cochrane Database of Systematic Reviews (1). doi:10.1002/14651858.CD007894.pub2. CD007894. ^ Serban C, Sahebkar A, Ursoniu S, Andrica F, Banach M (2015). "Effect of sour tea (Hibiscus sabdariffa L.) on arterial hypertension: a systematic review and meta-analysis of randomized controlled trials". Journal of Hypertension (33.6). doi:10.1097/HJH.0000000000000585. ^ Mohamed R. Fernandez J. Pineda M. Aguilar M.."Roselle (Hibiscus sabdariffa) seed oil is a rich source of gamma-tocopherol." Journal of Food Science. 72(3):S207-11, 2007 Apr. Vaidya, K. R. (2000). "Natural cross-pollination in roselle, Hibiscus sabdariffa L. (Malvaceae)". Genetics and Molecular Biology. 23 (3): 667–669. doi:10.1590/S1415-47572000000300027. Look up roselle in Wiktionary, the free dictionary. Wikimedia Commons has media related to Roselle (plant). Hibiscus sabdariffa in West African plants – A Photo Guide.